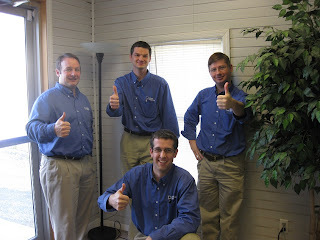 Dynamics Small Business: Our Dynamics GP Team is Ready to Head to Convergence 2011! All about growing small businesses using Microsoft Technologies to compete and grow. Microsoft Dynamics GP (aka Great Plains) and the now defunct Microsoft Small Business Financials and Windows Server infrastructure. Our Dynamics GP Team is Ready to Head to Convergence 2011! Our team is ready to head to Convergence 2011 in Atlanta, GA! Convergence is the premier Microsoft Dynamics event where we increase our ability to help you, our customer, optimize your business and improve your bottom line. This event serves as the meeting point for the Microsoft Dynamics Customer and Partner business community. We are ready to learn more about GP 2010, host clients/prospects and meet some of our regular vendors. If you want to meet us there you are welcome to drop us a line—we’d be glad to meet you in person. Visit with one of our team members to find out more about SmartSearch, the new "Google for GP." It takes the pain out of searching for & finding the information you need, giving you results in mere seconds. You can also look here for more information. Our GP consultants will be out of the office from Monday, April 11 – Wednesday, April 13. If you need support during that time you can call in and we will schedule you to be taken care of ASAP beginning on Thursday the 14th. Hey I don't have words to describe this post. I simply want to say that absolutely informative post. It inspires me a lot. Keep posting. Please note that my Windows PBX Blog and new PBX content is now at http://www.windowspbx.blogspot.com/. Please browse over there. Please bookmark that blog! Thanks.